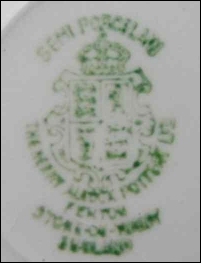 unsure why this mark says 'FENTON' because the Henry Alcock Pottery was at the Clarence Works, Stoke from 1910-35. 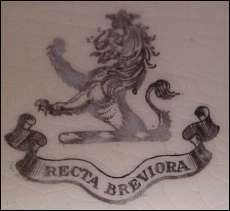 Mark of a lion with "Recta Breviora" in a ribbon below. 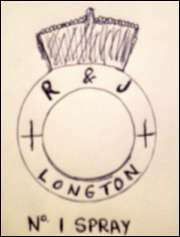 "We have a handwritten note in our edition of Godden stating "SR with lion on each side and crown on top. Ridgways". Unfortunately, there is no note to explain this. 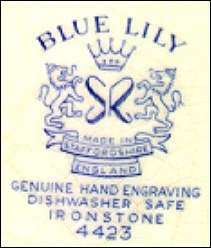 I have to say that the mark looks recent, and not particularly like at Staffordshire mark. However, it could have been a late Ridgways production for the American market." 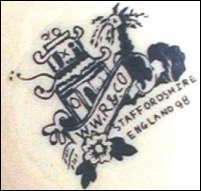 This comment, coupled with another Ridgway mark which has "SR" at the top and also is marked "IRONSTONE" seems to support Ridgway Potteries as the maker.